A Monochromatic Color Scheme Can Be Many Things — Except Boring! People may think that a monochromatic color scheme is boring. After all, it’s only one color. Yes, it’s one color, but it includes the darkest shade to the lightest tint of the same hue. 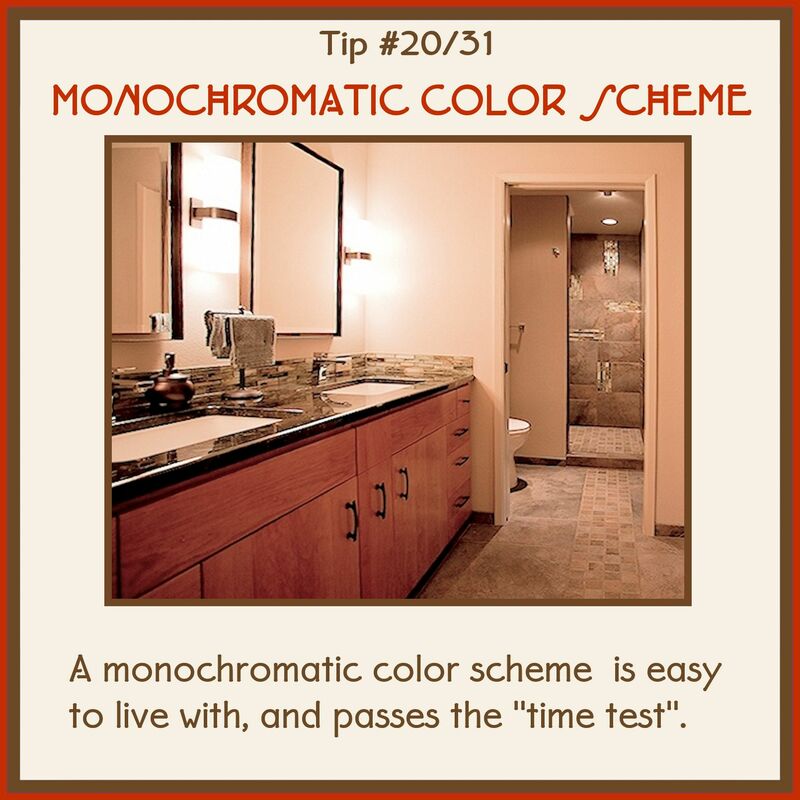 For a monochromatic color scheme to be effective, there should also be contrast in texture, smooth to very rough. 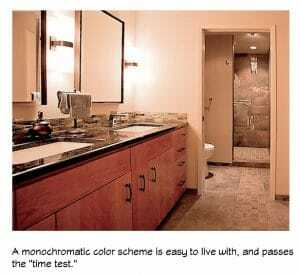 Every color in the world can be the basis for a monochromatic color scheme. Color psychology has been studied for hundreds of years. 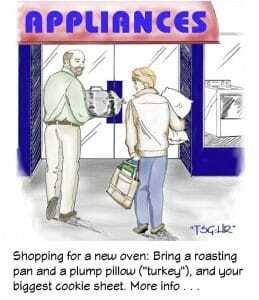 Discuss appliances with your family and decide what appliances are needed and wanted (see information below). Find some alternatives on manufacturers’ websites; a complete list of appliance manufacturers and links is on the Wikipedia site. Create a “wish list” of appliances. Most sites will show the suggested retail price. 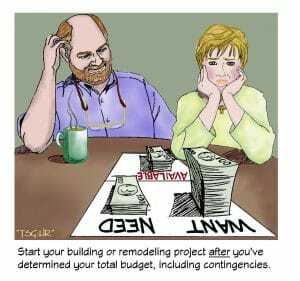 This will help you establish a realistic budget. Whether your home is traditional, transitional, Craftsman, contemporary, or some other style, your kitchen must have architectural integrity with your home. Why? Because your kitchen is the heart of your home, it needs to blend with and complement the surrounding rooms. 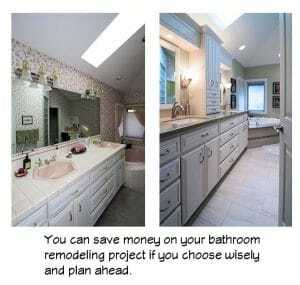 You may like many different styles, but you chose the style of your home because it represents and fulfills you. With emphasis on ROI, it makes sense to have your kitchen style be consistent with your home, so you can sell it faster and for a higher price. 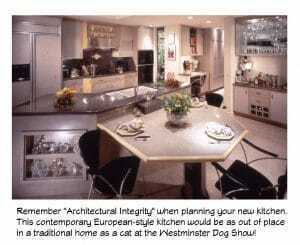 Can you imagine how out of place the kitchen project featured in this tip would be in a traditional home — or as out of place as a cat at the Westminster Dog Show! The major purpose for creating accessible bathrooms is to help people perform daily health and personal-care needs without minimizing their personal value. 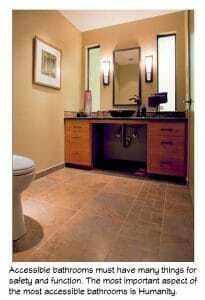 What’s the important feature in a great accessible bathroom? Humanity! There are required features, of course, but they don’t have to be a reminder that the person who needs them is in-valid. Quality of life, and personal esteem are too often the lowest-priority features. Other terms used synonomously are barrier-free design, aging-in-place design, and lifetime livability. 32″ wide, minimum. There are offset hinges to make the net opening of 32″ wide doorways more accessible. Pocket doors are good, but have limitations regarding location, and pulls may be hard to grip. 36″ wide doorways are better. 5′ turning radius (without a lot of “back and forth” maneuvering). Same level on both sides of a doorway. Slip-resistant hard surface that will allow wheelchairs and walkers to glide effortlessly. Having two sinks is great, but they have to fit in the space available, which means that the side-by-side concept has to be bypassed if the available space for two sinks is less than 66″ wide. 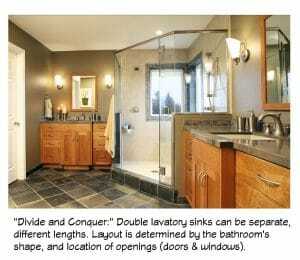 Below are two examples of bathrooms that are 5′ x 10′-3″ and 5′ x 11′-2″. 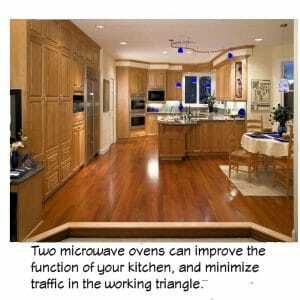 Do You Want Multiple Microwave Ovens In Your Kitchen? Most of us have a microwave oven that we use regularly. Why would multiple microwave ovens help the function of our kitchen? 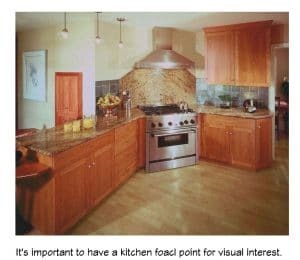 If you’re planning to remodel your kitchen, this article may help you think about and plan for an additional microwave.